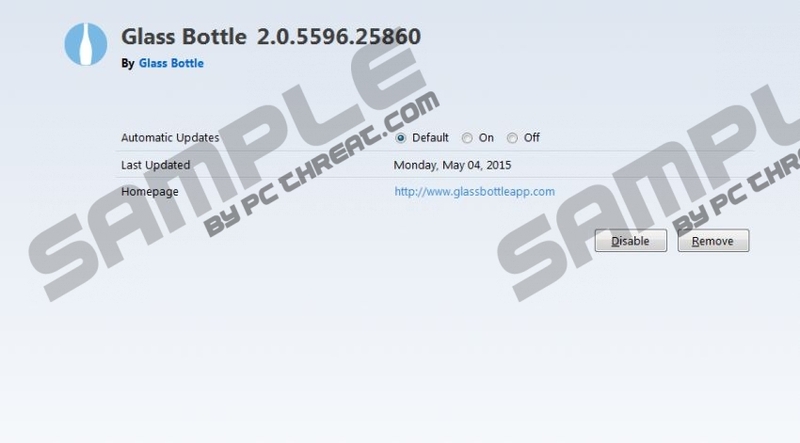 Glass Bottle is a rather silly name for an adware application that has nothing to do with bottles. Our research shows that this application is quite dangerous, since it displays advertisements of unreliable nature. So we advise anyone who might have this infection on their computers to remove it immediately. Failure to do so might have undesirable consequences, because the content promoted by this adware program in known to be a source of infection. In addition to that, Glass Bottle has the ability to track a user’s browsing habits and send the information back to its developers or their clients for analysis, so you should remove the app if you do not wish to be spied on. In any case, we will go through the information about this infection in more detail. Glass Bottle is remarkably similar to adware apps developed by SuperWeb LLC. However, it is a whole different breed on infection. The app is based on the Injekt engine, which is quite widely used by adware developers. The developer of Glass Bottle is actually unknown, but we were able to determine its clones. The list includes adware, such as Positive Finds, Strong Signal, Roaming Rate, and Assist Point. Hence, we recommend that you remove any of the aforementioned infections from your computer as well. Our research has shown that Glass Bottle is capable of displaying advertisements as pop-ups, coupons, and so on. So there is really nothing special about this infection. The ads are annoying and intrusive, but that is not the worst part. You should remove this application, because the ads it promotes come from unreliable sources, namely cyber criminals and various scammers. The app is known to be used as a method to distribute malicious applications, such as ransomware, and rogue anti-malware scanners to extort money from users unfortunate enough to get infected by Glass Bottle. On top of that, the app can gather and transmit information about the user’s browsing habits, which include search and browsing history to adjust marketing tactics. We recommend that you remove this application in order to save yourself the trouble of dealing with far more serious infections. Note that your computer might be infected with malware such as ransomware, which will be impossible to remove manually. You should also consider privacy as your top priority, and put an end to this program’s spying on you. So feel free to use our manual removal guide below. On your keyboard press the Windows key + X. Locate Glass Bottle and right-click on it. Locate Glass Bottle and click Uninstall. Quick & tested solution for Glass Bottle removal.